But you know the hoity-toity, pat ourselves on the back demeanor of which I speak. We live the SLO life, which is so slo we don’t have the time to get worked up about “W”s. We’re as relaxed as cucumbers floating in melon consommé. People literally do vacation where we live. Big important people who wear ties, tuck in their shirts, and wear shoes with laces. Take PG&E’s executives, for example. On the night a withered natural gas pipeline exploded in San Bruno—killing seven people as of last count—the higher-ups were reportedly down in our area of the coast to wine, dine, and partake in the most cliché “the man” activity of golf. There’s not much to harp on here, but the content still seemed worthy. I’m not that upset because I’m not that surprised. Junkets are the social lubricant for executives of all levels. If there isn’t a round of golf or PowerPoint you can be sure a bunch of suited dopes aren’t going to be able to work. In fact, a lot of them would probably be found wandering aimlessly, bumping into walls. These suckers just happened to have bad timing. In other news, Undersheriff Steve Bolts got off with a slap on the wrist. It seems he wasn’t really that drunk, just a .07 drunk, which isn’t a .08 drunk, which would legally classify him as drunk if he were behind the wheel. I guess I have to take a step off my pedestal here. I’m bummed that Bolts got off, only because the cynical little heart powering the larger Shredder robot shell likes seeing public officials get rug-burns on their knees from dealing with the legal system they’re supposed to enforce. Then I took a step back, and a few steps forward, and then a few more steps back. Bolts was driving with booze in his system, sure. But if here were just an ordinary Steve-schmo, and he got nailed for having just-under-the-legal-limit-of-alcohol-filled blood—and say he came to New Times to raise a fuss—we’d probably raise a fuss, too. So I don’t know, maybe it’s a double standard. Rats. If I put my skeptic’s hat on, though, I might say Bolts got a reckless driving conviction. And he had alcohol in his system. Usually this is a bad thing, because of the county’s wet reckless/zero tolerance policy. Now I’ve confused myself. Which reminds me of other things I don’t know. I still don’t know what’s up with this guy John Wallace and his firm The Wallace Group. In both the South San Luis Obispo County Sanitation District and Avila Beach Community Services District, Wallace holds dual roles—made hunky dory by funky district contracts—as an administrator and the head of a private contractor that takes the lead on many district projects. Well, the South County district says Wallace is just peachy. They released a report by this guy Richard Thomas of Thomas Consulting in response to a district employee’s complaints that the district spent too much on a chemical tank and did something bad in regard to roof coating. I don’t know what that something is because Thomas or someone blacked out the entire paragraph. About half of the next page is redacted, too. Thomas goes on to say that the complaint is way off base. And while Wallace’s roles “can provide the ‘appearance’ of a conflict of interest,” he’s a cool dude, anyway. I guess I still don’t get it. Maybe you should redact all of that. I also don’t know where this Lotto winner guy or gal is. Do you? How about you? No? Phooey. I don’t know why it’s a bummer for me. I guess I just want to see if all the rumors are true. There’s a ton of ’em out there, and I won’t go on repeating all the whacky scuttlebutt around misty little Morro Bay. I do know, though, that almost a month after the win was announced, the winner of the sixth largest jackpot in state history still hasn’t come forward. It’s kind of bizarre. Even the Lotto peeps say it’s a tad unusual for someone to take so long before claiming the cash. The commission had to put out a few press releases reminding Joe or Jane Moneybags to claim the ticket. But within days of the initial announcement last month, everyone from the Trib to “Best Local News Source” KSBY reported the supposed winner’s supposed employer and/or supposed name and/or supposed rumors. Lately, the rumor mill is on a tornado-path through Morro Bay. I’m not going to repeat the rumors, but they’re really good, like honk-my-hooter-national-media-frenzy good, if they’re true. All we know is the supposed winner has moved out of his/her house, which is now up for rent. He/she also hasn’t showed up for work since the winning ticket was announced. In fact, no one knows where this lad or lass is hiding, and actually, some people are kind of worried. So come forward, my friend, and cash in on your millions. When you do, remember that all the people who didn’t speculate wildly about you enjoy Ferraris stuffed with candy. I don’t know where you can reach the Shredder. 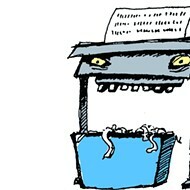 Maybe try shredder@newtimesslo.com.